I am trying to keep up with the shows that come to theatres about the lives of great artists. I noticed that this one is coming May 2nd, at least here in Victoria, B.C. Caravaggio -- The Soul and the Blood is a moving journey through the life, works and tormented existence of Michelangelo Merisi da Caravaggio, one of the most controversial and mysterious figures in the history of art. It is one of the first Italian films to be shot in 8k. 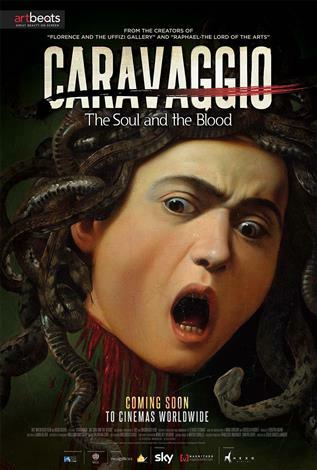 Caravaggio was a revolutionary artist and, as a result, often little loved by his contemporaries. He travelled all over Italy in search of fortune or perhaps in search of himself, escaping from the enemies he invariably made along the way. Milan, Florence, Rome, Naples, Malta: 5 cities, 15 museums and 40 of the most famous artworks in the artist’s typical style, filmed in the places they were specifically created for, or in major museums in Italy and the rest of the world where they can be found today. This Art Film tells the story of Caravaggio’s artworks through in-depth research into documented evidence, placing a particular focus on his life, a life of light and shade, contrast and contradictions, of being a genius and living on the wild side, finding echoes of his personal experiences in his masterpieces."